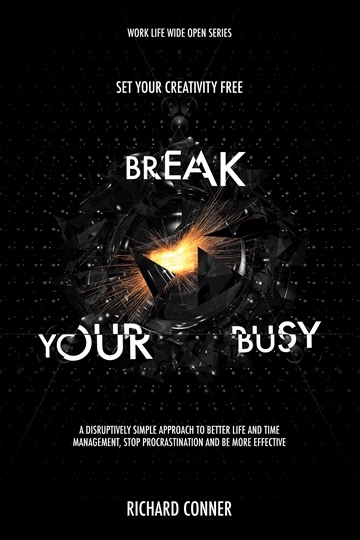 Break Your Busy - Set Your Creativity Free : A Disruptively Simple Approach to Better Life and Time Management. Stop Procrastination and Be More Effective. We call for better life and time management techniques to help reduce stress and overcome overwhelm so that we can be yet more productive. Despite our best efforts these surface level solutions only provide temporary relief from the persistent undesirable symptoms of the High Definition Life context we are living. They cannot address the deeper seated source of our mutual discord. They ignore the underlying cause of inner conflict that drives this incessant cycle of work for work’s sake. To solely use time management, motivation and anti-procrastination techniques to help you feel better, less stressed and more purposeful is like trying to keep the rain off with a sieve during a thunderstorm. You will get soaked wet through and your life will still be riddled with Busy Work. When fully connected to your creativity there is no need for the sticking plaster of better time management. Your Real Work of the moment will be known to you. Resolving never-ending priority conflicts, being pulled from pillar to post, overworked and underpaid will quickly become things of the past. With this book, you’ll be able to quickly identify what Busy Work is for you and start using simple strategies to eliminate it from your life. When the dust settles you will find yourself doing what you want instead of trying to force yourself to do the things you don’t. You will feel more purposeful, fulfilled and happier. More in tune with your neglected creativity you will be willing and able to take action to bring it to life in the world, either at home, in your relationships, at work or in your business. richard@richardjamesconner.com. I'm looking forward to hearing from you. Entrepreneur architect business owner suddenly quits his international creative agency and London home. Selling everything he moves to Thailand to find time, space and freedom to rediscover his creativity and allow his Real Work to emerge. He finds himself constructing a dinosaur on the beach, living in a cave and designing for the fun of it again. Most importantly he is compelled to write. The outcome of his journey is a series of books that explain in detail why making significant life change amidst the High Definition Life technological revolution that is taking place all around us is now so imperative it is ignored or avoided at our peril. His writing focuses on how to instigate positive change locally and globally. Leaving no stone of his personal journey unturned he candidly reveals, warts and all, what to expect in our internal and external world during this inevitable personal and impersonal metamorphosis. The process of understanding and appreciating the conflicted life context and content inherent in this incoming change is covered in depth throughout his work. How to handle this transition from chaos into order and make it work for rather than against us is described through simple, unique and never before seen conceptual models that are readily applicable to our day to day lives. Broadly Richard’s writing, training, coaching, marketing and business courses and programmes revolve around The Seven Works, his core conceptual and practical blueprint for successfully navigating the High Definition Life. This extensive body of work explores how we can improve both our individual lives and the greater whole through Conscious Change, Creativity, Communication and Connection. His Play Work includes Heli-Skiing, Snowboarding and dancing Argentine Tango. Richard studied Architecture at Liverpool University and The Bartlett University College London (UCL). His professional career started with Nicholas Grimshaw and Partners (now GRIMSHAW) / Eden Project / Waterloo International Terminal / Berlin Stock Exchange. He then went on to co-found Piercy Conner Architects (now Piercy&Company) / Turnmills / Martello Tower Y / East Village alongside graphic design and CG illustration and animation studio Smoothe. Richard and his partners also co-created the Microflat, the worldwide press, and media phenomenon. Showcased with two live in Micronauts at Selfridges in Oxford Street, London the Microflat was heralded as the answer to London's escalating housing crisis. Most recently Richard co-founded Design Week Top 100 creative agency Assembly Studios / Arab Film Studio / Battersea Power Station / ImageNation and The Creative Assembly / Creative Torbay / Creative Kirklees / Creative Somerset / Creative Hertfordshire / Creative Swindon / Creatives Across Sussex. Now, Richard's focus is on writing and consulting on creativity within the High Definition Life through his creative publishing, marketing, and business consultancy Fast Space. He has held CEO, Managing Director, and Creative Director positions for over 20 years.